Overall factors: These Pure Protein bars are sweetened by Maltitol, which is a sugar alcohol with a glycemic index of 36. (more than half the GI of table sugar) I'm counting 50% of the Maltitol in these bars as net carbs for simplicity, which is low-balling since it's closer to about 67%. Hidden net carbs from Maltitol is reflected in the net carb counts and grades below. The Pure Protein "PLUS" bars use Isomalto-Oligosaccharides too, in which case I'll be counting 50% of these bars fiber as net carbs. They're also low in nutritional density and easy to overeat. I'm adding Pure Protein bars to the ever growing pile of keto unfriendly protein bars. They're just not made for keto dieters, with the inclusion of Maltitol and Isomalto-Oligosaccharides, it's obvious they don't care about raising your blood sugar. I wouldn't recommend supporting companies like Pure Protein that use misleading ingredients. 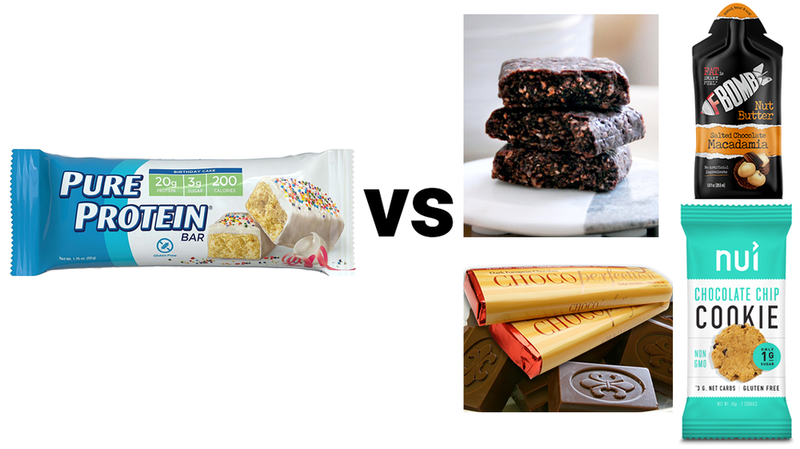 As you can see, when comparing Pure Protein bars to the best keto-friendly treats out there by net carbs per 100 calories, which is the most consistent indicator of keto friendliness, they're not even close. So in conclusion I recommend going with more keto friendly sweet treats like ChocoPerfection, Nui cookies, Keto Bars, and F-Bomb pouches. My personal favorite is ChocoPerfection, it gets an A- keto friendly grade and an A+ in taste from me.